The choir's musical director first started singing in the choir of Liverpool Anglican Cathedral at the age of seven. Before long, he moved to the prestigious Westminster Abbey, where he sang in the choir for five years. During that time, Martin performed at a royal wedding, took part in numerous recordings, sang solos at important events, and spent time on a tour around the United States of America. In his final year at Westminster Abbey, Martin became Head Chorister. After moving to Shrewsbury School on a music scholarship, Martin continued to sing as well as playing trombone in many bands and orchestras to continue his musical education. This included tours to France and Eastern Europe. Martin also took part in the Eton Choral Course, a summer event aimed at furthering choral skills. Since leaving university, Martin has combined his job as a primary school teacher with his music. 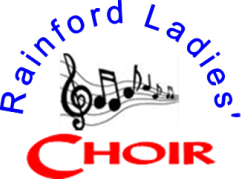 He has now been musical director of the Rainford Ladies' Choir for approximately 12 years, overseeing a change in the choir's repertoire and style. "My main aim is always to improve the choir's performance in every concert we do," Martin states. "I also enjoy picking out new music to perform, which I think will go down well with both the choir and our audiences. We always try to provide a great evening's entertainment in our concerts." Rebecca Lawson, Francesca Malone, Dawn Moorcroft, Susan Roughley, Kathryn Webb. Pat Smeltzer, Susan Webster, Irene Wells. Maureen Weston, Margaret Williams, Sara William.